Like every other event, the marriage ceremonies are also getting a makeover. 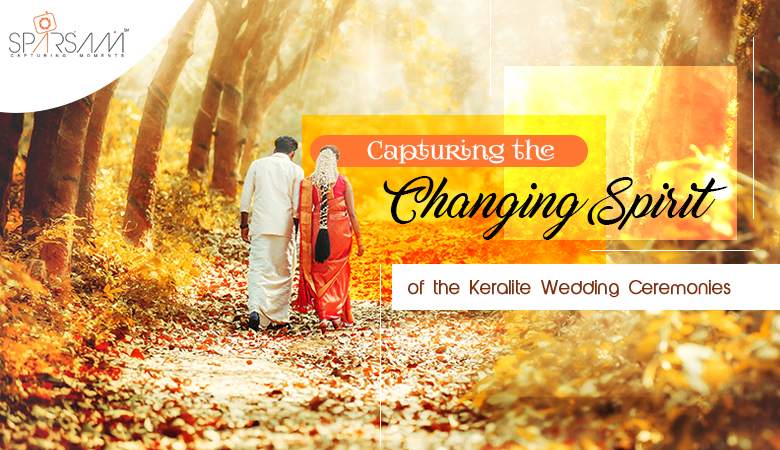 Although the traditional Keralite wedding ceremonies have held on with their roots, one cannot miss the slight tweakings. Couples are preparing their separate checklists which include small surprises. Such sweet changes are bringing a whiff of fresh air into the traditional mould of the wedding setup. The photographers in Kerala are capturing the signature statement of the wedding events and freezing the moments so that you could cherish them for a long time. Apart from the list of major things to be done, many separate lists keep on popping till the 11th hour of the event. Here, we would take a sneak peek at the checklist that comprises the titbits of your long cherished ideals surrounding your marriage. Habituated to see the tagline painted on the vehicles of the Honeymoon goers, with a little twist in the story, paint it on your denim or leather jackets or even a tee or a sweatshirt would be enough as well. You could wear it again on your marriage anniversary and announce loud and clear that you are an evergreen couple. You could hire photographers for taking your honeymoon snaps while you could flaunt these custom tees. Let the guests feel special. You can take an instant photo, write a funny or emotional message and add stickers to the guest books. The significance of an engagement ring is unmatched by anything else. You will wear it forever and hence, you should ensure its uniqueness. Hand-crafted geometric patterns could catch your imagination with its traditional yet not the run-of-the-mill appeal. Custom wordings could be painted or embroidered on the hat materials. Nothing could restrict the concepts of customised engagement rings. From fire opal to centre diamond, the stones could vary as much as the concepts. In the hands of an expert photographer, the personalised engagement ring would look surreal. Engagement bridal gift box should comprise of the pretty little things that would help your bride to kickstart the planning. A sleep mask could also bear the reflection to your artsy self. You could pamper yourself with the laser engraved customised coasters. Suiting the occasion, the customised cake toppers could be personalised with any words. It is easy for a traditional Christian bride to mesmerise the guests with her lace bridal robe. The photos captured would surely immortalise the moments. Do not miss the chance of leaving the sweet impressions of your wedding all over your room. How about the sweet sequin wedding hangers which would remind you of your blessings, every time you open your almirah? You could opt for the painted or photographed wedding posters. Your wedding photographers in Kerala would surprise you with some best examples. With many proficient photographers located in Thrissur and its neighbouring cities, hiring the best would not be a difficulty. However, care must be taken while making the selection.